Perhaps there's no better marriage than America and a quesadilla stuffed with Kit Kats. That certainly seems to be the case, given a new Harris Poll EquiTrend Study, which determined that the most cherished Mexican restaurant in the United States is Taco Bell. The home of monstrosities such as the Naked Chicken Chalupa, French Toast Chalupa, and Double Chalupa has captured America's imagination better than its counterparts, largely owing to its zany marketing strategies, the study found. For the study, 77,031 US consumers at least 15-years-old were surveyed online between January 3 and February 15. T-Bell outpaced Chipotle and Moe's Southwestern Grill, the latter of which had previously won the award in 2016 and 2017, Yahoo Finance reports. Chipotle, while still a wildly popular brand with its own share of cultish fans, has suffered remarkably in recent years, due to its sluggish recovery from a series of food borne illness outbreaks in 2015 that tarnished its public image. 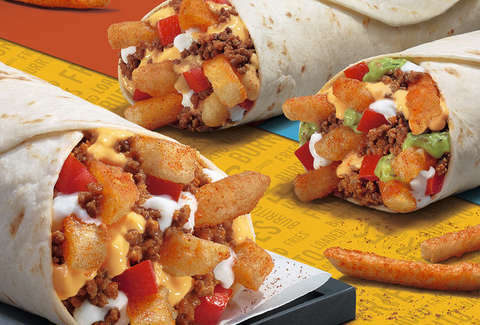 In any case, the proof of Taco Bell's marketing genius is fairly apparent, what with the company bantering with rock stars about french fries on Twitter, and occasionally teasing the public with its own beer. But please just remember that it's not actually Mexican food.